Use almost any cool old rotary dial phone on your VoIP lines with Dialgizmo! The Dialgizmo Pulse to Tone converter will convert the pulse dialing from your cool old rotary telephone to DTMF tones compatible with modern VoIP equipment. You can even dial * and #. 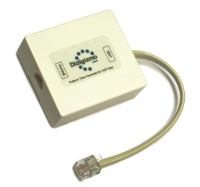 Dialgizmo connects between your rotary phone and the line (or VoIP box) and allows you to use your wonderful old rotary telephone on any VoIP phone line by converting the pulse dialing signal from the rotary dial into modern tone dialing signals. Dialing on a quality rotary phone is great. The tactile heaviness of the dial, the finger stop, the smooth whirr of gears, all provide you the opportunity to slow down and think, to actually have to expend effort to make a call. There's something special about the aura of these old phones, some retro technology amongst all of the modern stuff. And the sound of an old bakelite phone ringing still fills the room just like it would have done more than half a century ago. It's a great anachronism to be using a phone built more than sixty years ago on a VoIP service conceived from the age of the Internet, and paying just cents a minute to talk to anyone on the planet. So go on, dust off that old phone. It's not meant for the museum yet, it's meant to be used!